Samsung Electronics, the world leader in advanced memory technology, today announced that it has begun mass producing the industry’s first 2nd-generation of 10-nanometer-class* (1y-nm), LPDDR4X (Low Power, Double Data Rate, 4X) DRAM to improve the efficiency and lower the battery drain of today’s premium smartphones and other mobile applications. Compared to the mobile DRAM memory chips most used in current flagship mobile devices (1x-nm 16Gb LPDDR4X), the 2nd– generation LPDDR4X DRAM features up to a 10 percent power reduction while maintaining the same data rate of 4,266 megabits per second (Mb/s). Samsung will be expanding its premium DRAM lineup that is based on the 1y-nm process by more than 70 percent. This initiative began with mass producing the first 10nm-class 8Gb DDR4 server DRAM last November and continues with this 16Gb LPDDR4X mobile memory chip only eight months later. Samsung said that it has created an 8GB LPDDR4X mobile DRAM package by combining four of the 10nm-class 16Gb LPDDR4X DRAM chips (16Gb=2GB). This four-channel package can realize a data rate of 34.1GB per second and its thickness has been reduced more than 20 percent from the 1st-gen package, enabling OEMs to design slimmer yet more effective mobile devices. With its LPDDR4X advancements, Samsung will be rapidly expanding its share of mobile DRAM in the market by providing a variety of high-capacity products, including 4GB, 6GB and 8GB LPDDR4X packages. 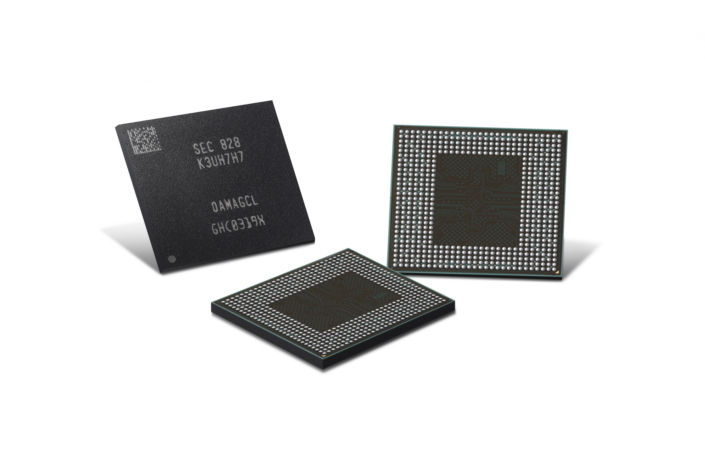 In line with its roll-out of 10nm-class LPDDR4X, Samsung has started operating a new DRAM production line in Pyeongtaek, Korea, to assure a stable supply of all mobile DRAM chips, in response to the increasing demand. *10nm-class denotes a process technology node somewhere between 10 and 19 nanometers.